We were given free tickets to BroadwayCon for review purposes. Any and all opinions expressed here are our own. Me- I love BroadwayCon. There's really cool people there. There's people in shows. There's people who work on shows. There's really cool panels. I met some of my favorite actresses there. They were really nice. I got to have my picture taken with them. 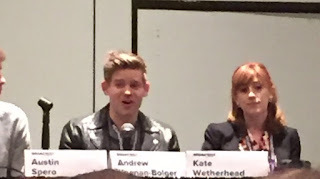 The worst thing about BroadwayCon is that it only lasted three days. I wish it was longer. Some of the panels we went to were one about a show that will be coming to Broadway based on the book Because of Winn Dixie and one about the two little girls who used to play Lulu in Waitress. There are also booths where you can enter to win very cool stuff. You can buy some awesome Broadway merchandise. They have general theater things and they have stuff from shows that are currently on Broadway and some from shows that are not currently on Broadway. This year that had some costumes from Phantom of the Opera since it was the 30th anniversary of that show. All in all, BroadwayCon is an amazing time, and I would extremely highly recommend going to BroadwayCon 2019. 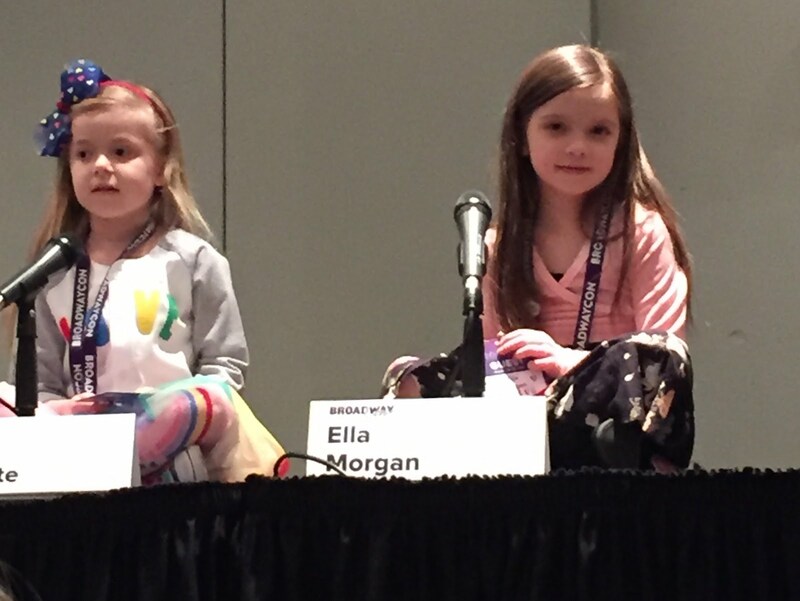 Mom - BroadwayCon is a fun convention for Broadway fans. It is a good place to connect with other Broadway fans as well as theater professionals both those who work onstage or offstage. It is a good place to find unique Broadway merchandise. It is a good place to find theater classes and theater camps. BroadwayCon is not only about watching and listening. If you want to you can participate too. You can join a singalong or you can enter a lip sync contest or participate in many other ways. The best part of BroadwayCon is that it is the most loving supportive environment you could every want to be in. Everybody is nice from the Broadway stars and other people who work on Broadway to the people attending the convention. You can do whatever you want. You can spontaneously burst into song (and most likely other people will join in). You can wear whatever you want to wear. Many people engage in cosplay by dressing up as a character in one of their favorite shows. Nobody is judged or looked at funny for doing those things. However, if you don't want to do those things that is fine too. The whole world should be more like BroadwayCon. BroadwayCon is open and accessible to everyone. I wouldn't really recommend it for children 4 and under though because it can be really crowded and not everything would necessarily be interesting to them. Anyone else will love it especially if they love the theater. BroadwayCon runs for three days. You can either buy a pass for all three days or you can buy separate passes for individual days which makes the most sense if you cannot make it to all three days. There are also gold passes and platinium passes with special priviledges attached like early access to the marketplace and front row access to all panels. The perks of gold and platinum passes are awesome. However, the price of them is very high and thus, they are probably not affordable to the average person. Luckily, you don't have to have a gold or platinum pass to enjoy BroadwayCon. If you go, you'll enjoy it especially if you love theater, it's that simple. 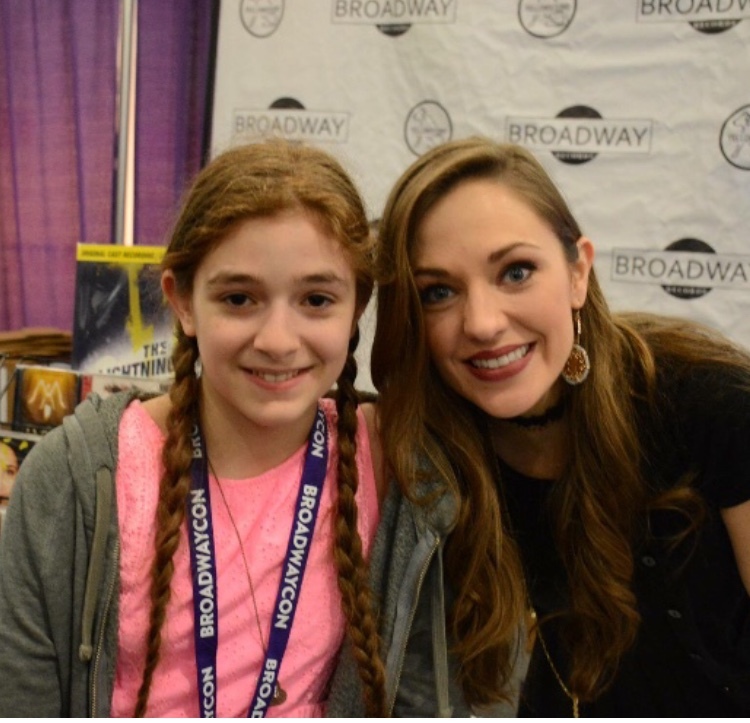 For more about BroadwayCon or to sign up to get information about the next BroadwayCon visit www.broadwaycon.com. And that's our view. Tune in tomorrow for Theater Thursday where we'll talk about some of the shows at BroadwayCon. Me - Today I am recommending BroadwayCon. BroadwayCon is a convention that happens once a year from Friday to Sunday. It is in January because that is a slow time for the theater. They have panels. They have booths where you can buy Broadway merchandise. They have photos and autographs. Also, there is so much more to it. 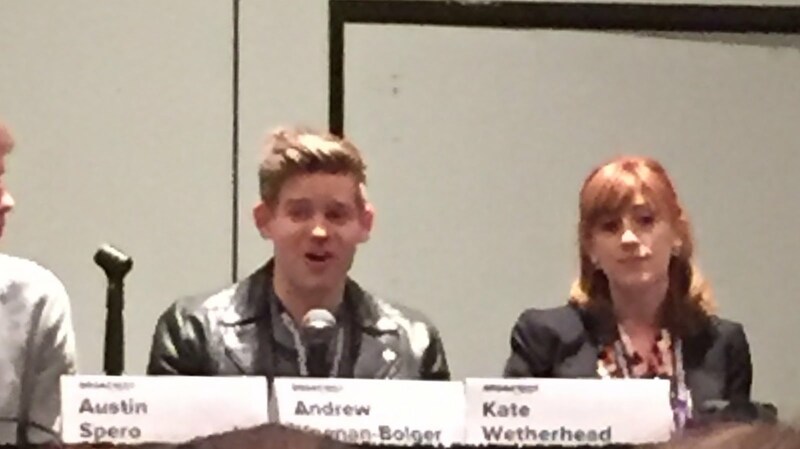 BroadwayCon is an extremely fun event, and I would highly recommend going next year if you can. Mom - Today I am also recommending BroadwayCon. 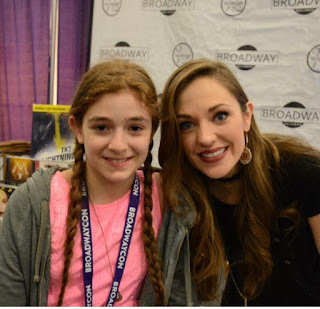 Everything Broadway related can be found at BroadwayCon including Broadway merchandise to buy, Broadway classes to sign up for, even Broadway actors, directors, and various other theater professionals to listen to, learn from and/or meet. Besides, all that there is so much more to do and see at BroadwayCon.Whether you work in the theater, you want to work in the theater, or you are just a fan of the theater, you will enjoy BroadwayCon. BroadwayCon is a theater lover's dream. Note: BroadwayCon is much too big to cover in just one post. 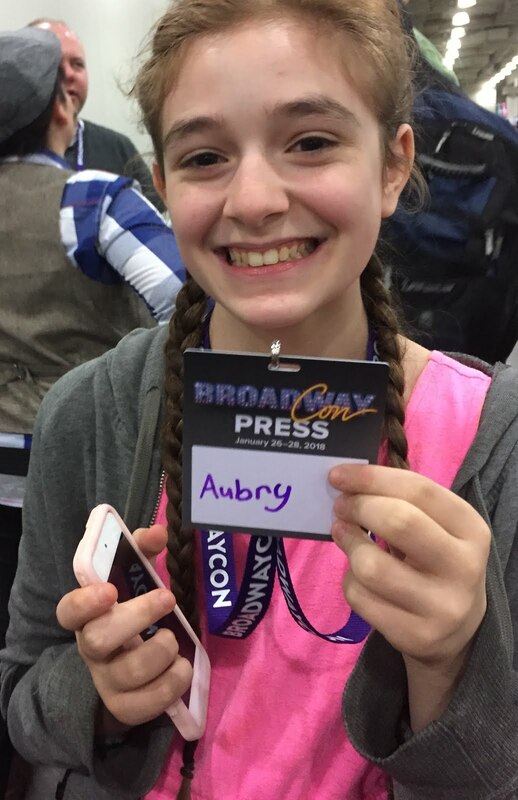 Accordingly, we will be talking more about different aspects of BroadwayCon for the next week through Monday February 5, 2018 except for Sunday when we will bring you our regular weekly Sunday Scoop post. Me - My topic for this month is hot chocolate. I am obssessed with hot chocolate. It is one of my favorite things. The only thing I liked about the cold is drinking hot chocolate. I like very chocolately hot chocolate. I love the little marshamallows in hot chocolate even though I don't like regular marshmallows. I drink hot chocolate both with the little marshamallows or without it. I don't like white hot chocolate. I do like candy cane flavored hot chocolate. I also like caramel flavored hot chocolate. Once we had a whole case of caramel flavored hot chocolate. That was great, but I prefer just regular milk chocolate flavored hot chocolate. I like both hot chocolate that you make in coffeemaker with a pod or hot chocolate that you make using a packet. It just depends on the brand Some brands don't taste as good as others. My favorite brand is Swiss Miss. Over all, I absolutely love hot chocolate. Mom - My topic for this month is change. My older daughter doesn't like change at all. However, there are all kinds of change. Some change is necessary. Time marches on, and we are all going to get older whether we want to or not. Some change is good. Some things actually change and improve. Like when one person invents something and then others keeping on adding things to it that make it even better. Some change is unecessary and sometimes even bad like the way they are always updating apps and some of the changes don't even make sense or are downright annoying. My problem with change is that it just seems like there is too much change too often these days. You hardly get used to something and then before you know it things are completely different. I would not want to go completely go back to a time when technology wasn't such a big part of our life. However, I sometimes wish life could be at least a little bit slower and change didn't happen quite so fast or quite so often. For more information or to purchase tickets, visit www.iseats.net/reserve/vtcselectproduction.php?u=8680488adf31f8eefba3100b1d1f6f9b&venue=66. Blue Moon Mexican Café Englewood presents Once in a Blue Moon Singles Night in honor of a rare Super Blue Moon Eclipse on Wednesday, January 31st. The Blue Moon – second of two full moons in one calendar month – will pass through the Earth’s shadow to give us a total lunar eclipse. Come find love on this auspicious super moon day with one of the top matchmakers on the East Coast, relationship expert, Arlene Vasquez. Arlene helps her clients find love with just an introduction; so let her help you find your perfect match. Arlene will be the host of the night and will offer inspirational relationship advice, ice breakers and lead the way for people to connect. This is a FREE event hosted by NJ’s hottest DJ - DJ Alex who will spin the hottest songs of today and yesterday, complimentary appetizers start at 9pm and there will be some fun games and prizes all in an attempt for people to get off their devices and actually talk to each other! Valentine’s Day just around the corner, why not take a shot at love at Blue Moon and let cupid do his thing. Faculty members at Kaufman Music Center's Lucy Moses Schoolare acclaimed performers as well as amazing educators! At this annual concert, they collaborate on chamber works to share their love of music with our community. The celebrated, Grammy-winning Kronos Quartet joins NYC’s acclaimed youth new music ensemble Face the Music for premieres of new works written for Kronos’s “Fifty for the Future”commissioning program. Rebel Playhouse is thrilled to present CONSTELLARIUM, a play with music for young audiences, directed by Susanna Wolk and written by and starring Arif Silverman, in association with Access Theater on 380 Broadway. CONSTELLARIUM begins performances Friday, February 2 with a limited engagement through Sunday, February 18. The performance schedule is Fridays at 8pm, Saturdays at 2pm and 8pm, and Sundays at 2pm. Weekend matinees will be followed by an optional workshop for kids. Tickets ($30 for adults; $20 for children) are available for advance purchase at www.rebelplayhouse.org. (Early Bird pricing good for $5off ticket purchases through January 15 with code EARLYBIRD). Rebel Playhouse’s interactive production brings audiences into outer space to learn what it means to be a refugee. CONSTELLARIUM is a powerful story about celebrating differences and learning from mistakes, that will speak to children and adults alike, particularly in a time when the world is doing otherwise. For more information or to purchase tickets, visit www.rebelplayhouse.org. For more information or to register, visit www.iplayamerica.com/event/mitzvah-sweet-16-super-sunday-showcase. In celebration of Judy Blume's 80th birthday, Symphony Space pays tribute to this beloved author with a day full of events for fans of all ages. Kids 8 and up are invited to an afternoon of readings by actors and a discussion with Blume book illustrator Debbie Ridpath Ohi and contemporary authors including Jacqueline Woodson (Brown Girl Dreaming) and Rachel Vail (Well, That Was Awkward), plus a rare NYC appearance by Judy herself.The event wraps up with a writing prompt and Q & A. Please note: This event is meant for children ages 8 and up and their families. Bank Street Bookstore will provide books for sale; there will not be a book signing. A "Judy Blumesday" event for adults will be held at 6 pm. The McKittrick Hotel (530 West 27th Street, NYC), home of Sleep No More, announces the North American premiere of Flight, an original form of theatrical story-telling direct from an award-winning run at The Edinburgh International Festival. Previews for the limited 8-week engagement will begin on January 30. Flight is an emotional and powerful work of art that invites the audience into its poignant story of human courage. Vox Motus Artistic Directors Jamie Harrison and Candice Edmunds created this unique and transporting experience based on British playwright Oliver Emanuel’s adaptation of Hinterland, a 2012 novel by Caroline Brothers. Tickets for the hour-long experience start at $45, and reservations are available between 5-9:30pm on weekdays and 2-11pm on weekends. The hotel’s rooftop The Lodge at Gallow Green and jazz speakeasy Manderley Bar are available to enhance the evening with packages that include dining, drinking and tickets. The Heath is located in The McKittrick Hotel, home of Sleep No More, at 542 West 27th Street, New York, NY 10001. Schedule and tickets are available online at www.mckittrickhotel.com or by calling the Box Office at (212) 904-1880. On Monday, January 29, 2018, Rachel Katzke, Walden Sullivan, Amadi Chapata, Demi Singleton, Annabelle Wachtel, Terrance Bell, Jr., and Chloe Bryan will all graduate from Horace Green. Tickets for School of Rock – The Musical are $59 - $155 and are available by visiting the Winter Garden Theatre box office Monday – Saturdays between 10:00 am – 8:00 pm and Sundays from 12:00 pm – 6:00pm, online at Telecharge.com, or by calling 212-239-6200. Performances of School of Rock – The Musical are Mondays, Tuesdays, and Sundays at 7 pm, Wednesdays, Saturdays, and Sundays at 2 pm, and Fridays and Saturdays at 8 pm. Theater Resources Unlimited (TRU) presents the TRU January Panel -Breaking the Silence: The Voices of Theater Around the World onTuesday, January 30, 2018 at 7:30pm (doors open for networking at 7pm) at The Playroom Theatre, 151 W. 46th Street, 8th fl., NYC. For more details, visithttps://truonline.org/events/breaking-the-silence/. Free for TRU member;$12.50 for non-members in advance ($15 at door), free for TRU. Please use the bright red reservation box at https://truonline.org/events/breaking-the-silence/, or call at least a day in advance (or much sooner) for reservations:212-714-7628; or e-mail TRUStaff1@gmail.com. Speakers to include Teresa Eyring, Executive Director of Theater Communications Group (TCG); Philip Himberg, Artistic Director of Sundance Institute Theatre program; others tba. Art can be dangerous, especially when the voices of artists express views contrary to their country's leadership. Many have been silenced, but others have overcome oppression and managed to be heard and sometimes listened to. We will look at how art is perceived, respected or repressed in various countries, and the part it plays in the lives of the communities that it serves. Are there ever ways for getting those in power to listen? Or is the better tactic to engage the population and inspire them to raise a unified voice? We will look at the impact theater in particular has had in effecting social change around the world, including our own country. Among many Americans, there is concern today that their voices are not being heard, and their needs are being ignored. Can art illuminate issues in ways that can generate greater understanding? Can theater be an effective tool for voicing concerns and stimulating discussion, and perhaps change? Is it even possible to get those who disagree with you to consider your viewpoint? And how do you do that? For more details, visit https://truonline.org/events/breaking-the-silence/. Downtown Jewish Life and the 14th Street Y present PAUSE/PLAY, an innovative Saturday afternoon of Shabbat programming at the 14th Street Y,344 E. 14th Street, NYC. PAUSE/PLAY invites attendees to hit the pause button in their busy lives and experience all that the Downtown Community has to offer. All are welcome in the community, Jewish or not, to join for a day of relaxation and renewal. From family yoga and story time to whiskey tastings and open swim,PAUSE/PLAY events feature activities for the whole family. PAUSE/PLAY will also feature a Community Passport that families can decorate each month and bring to each event for access to monthly raffles for deals to 14Y programs and other great prizes. Celebrate the "Birthday for Trees" with the 14Y! Together we will grow our understanding and awareness of the world around us through art, games, PJ Play! and many other fun activities for the whole family. As part of the Tu B'shvat celebration we will have wine tasting for grown-ups, as well as yummy holiday treats for kids to enjoy all day too. PJ Play! is back this month with WonderSparks puppets , based on the PJ Library book "Netta and her Plant"
PAUSE/PLAY is open to all ages in this diverse downtown community. Y Members: Free; Non-Members Advance Tickets: Children ($5), Adults ($10), Family Ticket (Up to 5 members $35); Day of Tickets: Children ($10), Adults ($15), Family Ticket (Up to 5 members $45). Works & Process, the performing arts series at the Guggenheim, presents A New Carousel with Jack O'Brien and Justin Peck on Sunday, February 4, 2018 at 7:30pm. Rehearsal for the Chicago World premiere of the Broadway-bound PRETTY WOMAN: THE MUSICAL begin Monday, January 22, 2018. PRETTY WOMAN: THE MUSICAL begins performances Tuesday, March 13, 2018, at Broadway In Chicago’s Oriental Theatre (24 West Randolph Street, Chicago, IL) for a strictly limited 5-week engagement, and will star Samantha Barks (Les Miserables) as ‘Vivian’ opposite Tony Award winner and Grammy Award winner Steve Kazee (Once) as ‘Edward,’ with Tony Award nominee Orfeh (Legally Blonde) as ‘Kit,’ Eric Anderson (Waitress) as ‘Mr. Thompson,’ Jason Danieley (The Full Monty) as ‘Philip Stuckey,’ and Kingsley Leggs (Sister Act) as ‘James Morse’ in a company of 24 that includes Allison Blackwell, Tommy Bracco, Brian Calì, Robby Clater, Jessica Crouch, Anna Eilinsfeld, Matt Farcher, Lauren Lim Jackson, Renée Marino, Ellyn Marie Marsh, Jillian Mueller, Jake Odmark, Jennifer Sanchez, Matthew Stocke, Alex Michael Stoll, Alan Wiggins, Jesse Wildman and Darius Wright. Tickets now on sale for PRETTY WOMAN: THE MUSICAL on Broadway and for the Chicago world premiere engagement. Tickets for the world premiere of PRETTY WOMAN: THE MUSICAL at Broadway In Chicago’s Oriental Theatre are available at all Broadway In Chicago Box Offices (24 W. Randolph St., 151 W. Randolph St., 18 W. Monroe St. and 175 E. Chestnut), the Broadway In Chicago Ticket Line at 800.775.2000, and online at www.BroadwayInChicago.com. Chicago world premiere tickets range from $33 - $110. The playing schedule for PRETTTY WOMAN: THE MUSICAL at Broadway In Chicago’s Oriental Theatre is: Tuesday through Friday and Sunday at 7:30pm, Saturday at 8pm, with matinees Saturday and Sunday at 2pm. Please note there will be added 2pm matinees on April 4 and April 11, and no evening performances on April 8 and April 15. PRETTY WOMAN: THE MUSICAL will begin performances on Broadway on Friday, July 20, 2018, at The Nederlander Theatre (208 West 41st Street), with an official opening night of Thursday, August 16, 2018. For Broadway PRETTY WOMAN: THE MUSICAL tickets call 877.250.2929 or visit www.ticketmaster.com. Broadway tickets range from $99 - $169. The playing schedule for PRETTY WOMAN: THE MUSICAL on Broadway is: Monday through Saturday at 8pm, with matinees Saturday at 2pm. Beginning August 6, 2018, the playing schedule is as follows: Tuesday and Thursday at 7pm, Wednesday, Friday and Saturday at 8pm, matinees Wednesday and Saturday at 2pm and Sunday at 3pm. Beginning Tuesday, January 30th, the Broadway blockbuster WICKED will welcome, to the Gershwin Theatre, Tony Award nominee ISABEL KEATING as Madame Morrible and Obie Award winner Martin Moran as Doctor Dillamond. ISABEL KEATING comes to the Broadway cast directly from playing Madame Morrible in the national tour of Wicked. She received a Tony Award nomination and Drama Desk award for The Boy from Oz, and has previously appeared on Broadway in It’s Only a Play, Hairspray, Enchanted April, and Spider-Man. MARTIN MORAN last appeared as Doctor Dillamond on national tour in 2011. His previous Broadway and Off-Broadway credits include Spamalot, Cabaret, Titanic, Bells Are Ringing, Big River, The Cider House Rules, The Tricky Part and All the Rage, among others. Roundabout welcomes Jamie Brewer as she takes on the title role of “Amy,” a woman with Down syndrome who helps her family deal with their father’s death.Together, they careen down the Great American Long Island Expressway, navigating strip malls, traffic jams and some serious (and not-so-serious) family drama. An unexpected turn reveals the moment that changed their lives…and the fact that Amy may be the only one who knows her own mind. Amy and the Orphans will begin preview performances Off-Broadway on February 1, 2018, and open officially on March 1, 2018 at the Laura Pels Theatre in the Harold and Miriam Steinberg Center for Theatre (111 West 46th Street). This will be a limited engagement through April 22, 2018. Amy and the Orphans plays Tuesday through Saturday evening at 7:30PM with Wednesday, Saturday matinees at 2:00PM and Sunday matinees at 3:00PM. Rehabilitation Through The Arts (RTA) will present a reading of Home is a Verb, a new play by Melissa Cooper based on true stories about the challenges faced when returning home after prison. Directed by Richard Hamburger, this one-night-only presentation of Home is a Verb will benefit RTA, whose mission is to use the transformative power of the arts to develop social and cognitive skills that prisoners need for successful reintegration into the community, while raising public awareness of the humanity behind prison walls. The cast will feature professional actors (TBA) alongside RTA alumni, and actor Michael K. Williams, best known for his portrayal of Omar on HBO’s The Wire, is scheduled to appear that evening as a special guest. Home is a Verb will take place on Monday, February 5, 2018 beginning at 6:30 p.m. (7:00 p.m. curtain) Off-Broadway at The Mainstage Theater (416 West 42nd Street). After working inside the prison system for over 20 years, RTA has a significant community of alumni who have participated in their programs inside and have since been released (while the national recidivism rate is nearly 60%, less than 7% of RTA members return to prison). Over the past three years, a group of RTA alumni have met regularly to share their stories detailing the challenges of reentry, which were woven into a this full-length play by Melissa Cooper. Home is a Verb highlights years of hopes and dreams as they slam painfully against reality. When you return from prison, you are a different person. Home is a different place. One man returning from 32 years in prison needs help crossing the street; another is brought to tears when he loses sight of his wife in Walmart. The play explores reentry issues large and small (How do I submit a resume online and, by the way, how do I account for those missing years? A hamburger now costs HOW MUCH?!) with the goal of creating a better understanding of the imporatance of effective rehabilitation and support through the process of reentry. Rehabilitation Through The Arts (RTA) will present a one-night-only staged reading of Home is a Verb on Monday, February 5, 2018 at The Mainstage Theater (416 West 42nd Street, NYC). A pre-show reception will begin at 6:30pm, the performance is scheduled to begin at 7:00pm. There will be a post-show Q&A with alumni, followed by another reception at 9:30pm. General reserved seats are priced at $150, and VIP reserved seats are $250 (both ticket levels include performance, Q&A and pre- and post- reception refreshments). Visit www.rta-arts.org/benefit to purchase tickets.